of citrusy Amarillo and Cascade hops. To some, APA stands for 'American Pale Ale' (or American Psychological Association), but we don't really fit either of those; so, Almost Pale Ale might need some explaining. 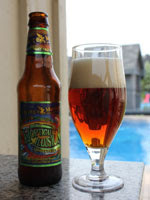 Hoptical Illusion approaches the characteristics of a pale ale --but takes a quick u-turn at the end. At 32 IBUs (+ or -) versus 22 and way up for English Pale Ales, we're hoppier than most Ontario beers, but not so crazy that you can't stomach more than one or must surrender the enamel off your teeth." This beer from Flying Monkeys Craft Brewery pours a wonderful orange/mahogany colour, almost like a fiery sunset. Lots of tiny, tight bubbles, with three fingers of fluffy, cloud-like khaki head. Just a gorgeous looking beer! Right away you get a bouquet of malty sweetness, breadiness and earthy qualities. Then you get some delightful citrus notes. Some grapefruit, orange/tangerine are quite pleasant from the Cascade and Amarillo hops. A slight hint of pine is also present. More malty than I was expecting. You get some piney bitterness upfront, that mellows towards the earthiness in the finish. Some bitter citrus to the back of the throat and finish. Definitely a Cascade character to this beer. Very nice overall flavour. A very solid offering. The aggressive carbonation leaves a fantastic mouthfell. That paired with the 5% ABV, makes this beer incredibly drinkable. As I finished the beer, the hops really become the star of the show without showing off. Well balanced and very tasty. Definitely an A- for sure. If I was looking for a more hop forward sessionable beer, this would be my pick. Glad I bought six of them to enjoy by the pool!